The doctor duo that brought you to the low-carb lifestyle shows you how to regain in midlife the figure of sleek, flat-bellied youth.Why is it that even though we might maintain our high school weight, few of us maintain our high school belt size? In your twenties and thirties, the layers of fat on top of your abs were the problem. But once you reach middle-age, the enemy shifts. 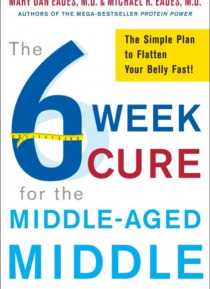 The 6-Week C… ure for the Middle-Aged Middle is the first book to deal specifically with the issues we face in the next stage of life, providing a plan for eliminating the unhealthy fat that accumulates around the organsvisceral fatthat is the true cause of the middle-aged bulge. The good news is that with the right diet, visceral fat can be quickly reduced and eliminated, enhancing both your looks and your health. Even after twenty years researching and refining the science of weight loss and management, bestselling authors Drs. Michael and Mary Dan Eades fell victim to the middle-aged middle themselves. Although otherwise fit and healthy, both lost the flat belly that signals youth. In The 6-Week Cure for the Middle-Aged Middle, they share the simple dietary program they created to shed the weight. Discover: *; How eating saturated fat can actively trim your middle *; Why the ';eat less, exercise more' prescription failsand what to do about it *; Why ';inner' and ';outer' tube fat measurements are important to your health *; How to fight the fat stored inside your liver that leads to hard-to-lose middle-body flabFrom the Hardcover edition.